Composite Wood Post Top Cap Colour matched to the Posts and boards. You can estimate your delivery charges by adding the item to your basket then viewing your basket. 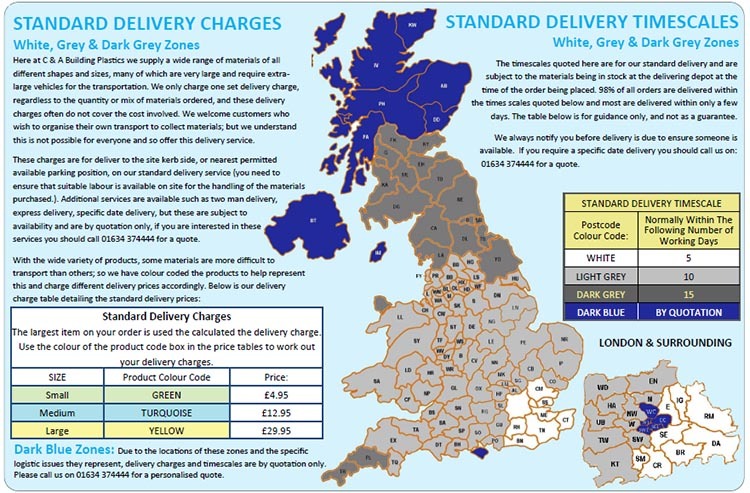 Enter your postcode in the "Calculate Delivery Charge" box and the delivery options and costs will be shown. If you add new larger items then you will need to re-enter your postcode to recalculate the estimate. We only make one delivery charge and this is calculated on the largest item in your basket. Delivery times vary depending on the items ordered and the location of the delivery address. 90% of deliveries are made within 5 days and 98% of deliveries are made within 8 days and on occasions a small number may take a little longer but this is normally due to things like severe weather events. 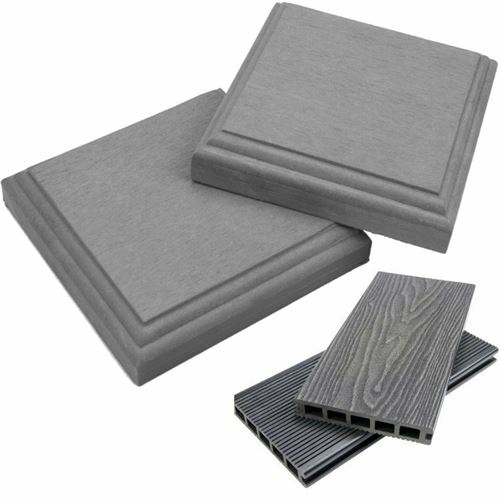 Most of our products are delivered on our own specially designed delivery vehicles this gives us greater control over delivery times and helps to prevent damage. We do use carriers to deliver some items as this can sometimes the quickest method unfortunately many items are not suitable due to the size and possibility of damage. Items marked with a Delivery Code: are not a stocked item and are despatched directly from the manufacturing warehouse please read the product description where the specific time frame for these items are listed seperatly. Delivery charges are applied to all orders. These charges are added automatically depending on your postcode you can estimate your delivery costs by entering your postcode at the shopping basket stage and clicking "FIND". The charge will then be shown in the order summary totals. Your final order total including delivery charges will be shown once you have registered your address but before you make a payment, no additional charges are added once you make your payment. Our vehicles that are covering distance areas (everything but the white zone shown below) traditionally leave on the Monday morning for the whole week. If you order at the weekend we will try and get your order processed and on the vehicle in time to leave by 9am Monday morning. We cannot guarantee every order is processed in time but we will always prioritise these orders. If you are unsure then please call 01634 374444 for more delivery information. We deliver to most of the UK Mainland however the following postcodes areas are by quotation only AB, BT, GY,HS,IM, IV,JE,KW, PA, PH,PO30 -PO41 & ZE. Delivery charges are based on the largest item in your shopping basket; if you have a copy of our latest catalogue then you will find the product price tables all have a colour code to help calculate the price. Due to physical size of the products we supply these have to schedule into a delivery run on the appropriate vehicle. We optimise all orders to ensure the most economical and environmentally friendly routes; this means that your order may take more than 7 days to arrive. We cover most of the UK once a week but outlying areas might be every two weeks depending on the time of year and what day you place your order. Sometimes orders are dispatch your order within a day or two depending on when you place it. Some Items can be sent via NEXT DAY delivery, if it is possible then you will have the option to choose this at the checkout. We use UPS to send these items and they cover most of the UK however some remote areas can take longer. Please note orders need to be paid and processed by 2pm to ensure they are packed and ready for dispatch. NEXT DAY is considered as the next working day, weekends and bank holidays are not considered as working days. If you are unsure or would like to enquire about a next day delivery then please call 01634 374444 and someone will be able to provide you with a price. Delivery to Northern Ireland the surrounding isles and Northern Scotland is possible and we advise customers to contact us directly, you can still add items to your basket and register but DO NOT make a payment. We will then be able to view your order and price it for delivery. We advise customers that they do not book any contractors until they have received their order, checked it through and ensured it is correct to their requirements.